Limelight is an attractive green / yellow apple, with a crisp juicy bite and a rich apple flavour. 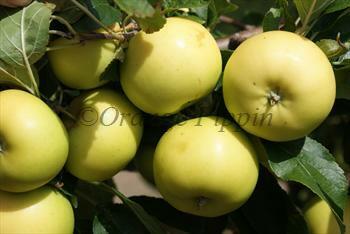 It is easy to grow, and ripens mid-season - usually the middle of September in the UK. In good conditions it is quite a heavy cropper. Please fill in the details below and we will let you know when Limelight apple trees are back in stock. Limelight is in flowering group 3. Limelight is self-sterile and needs to be pollinated by another tree of a different variety nearby. Since it flowers in the middle of the blossom season it can be pollinated by most other apple trees. Limelight has been developed specifically for UK gardeners, with a parentage that includes such reliable garden varieties as James Grieve and Discovery. It has some disease resistance too. Kent, UK, 2000. Related to James Grieve, Golden Delicious, and Discovery.